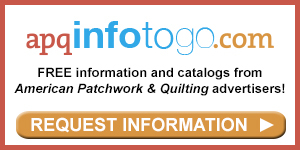 See the featured quilts and web-exclusive color options and projects from the American Patchwork & Quilting December 2013 issue. 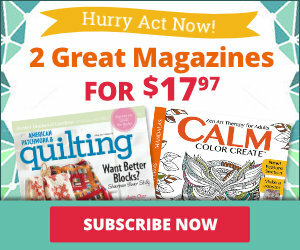 The December 2013 issue of American Patchwork & Quilting is on sale from October 8--December 3. 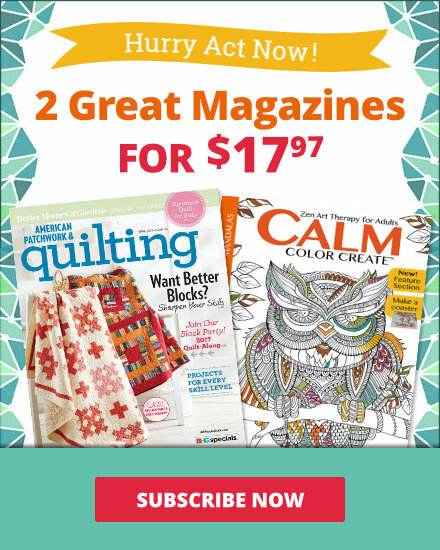 Angela Walters shares her secrets for finding fun in finishing quilts. See a slideshow of her beautiful quilting here. See Angela Walters' website here. Strip-piece a three-color throw starring Norwegian-inspired motifs and stunning quilting. 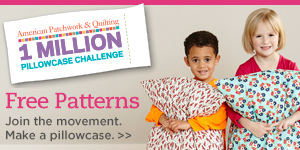 Use fabrics that have a watercolor look to give the geometric quilt pattern a softer appearance. In this wall hanging version of the snowflake became a stylized flower. A multicolor mottled print provides an interesting backdrop to the flower while still being calm enough to prevent visual overload from multiple busy prints. It's a lucky day when you can make two projects for the price of one! This pair of projects--a batik throw and coordinating table runner--features a variation on The Wishing Ring block. See the next slide for the table runner. Create this table runner using an extra quilt block and the half blocks trimmed from the quilt top. Instead of two-color blocks, use three fabrics in each block in this version of Good Fortune to create interesting rings of color. Add a border to frame the mix of colors and patterns. Search your stash for the littlest bits to make Double Nine-Patch blocks. Then intersperse light-background star blocks for a quilt top that sparkles. Tone-on-tone pastel prints result in a version of Star Patch that has less contrast than the original. Because this quilt used fewer fabrics than the original scrappy quilt, you can take advantage of strip-piecing to save a bit of time. Navy-and-shirting Lost Ship blocks are simply set side by side for a scrappy throw with historical appeal. Lost Ship blocks rotated 180° form bright orange and orange-and-pink vessels swimming in a cream sea. A green print inner border provides an unexpected pop of cool color. The neutral background offers a great space for beautiful quilting. Fabrics: Biscuits and Jam Perfect Pairings and Oats and Herbs Perfect Pairings collections, both from Kim Diehl for Henry Glass & Co.
Piecing and appliqué, reds and greens, flowers and fruit--contrasts in the techniques, colors, and motifs on this little quilt result in a harmonious blend. For the leaves in a neutral-color, fusible-applique version of A Delightful Pairing, play up the differences in five fabrics. Some leaves are cut from fabric with texture, such as moire, crackle, and ikat. Fussy-cut a floral to create leaves that look like buds and cut around leaf motifs, positioning the veins down the center of the leaf appliques. A bit of pre-planning and organization takes the guesswork out of strip-piecing the V units flying across this quilt. The bonus? No set-in seams! Get the fabric legend for this quilt. Imagine ice crystals on a winter night for this silver-and-blue version of Flight Plan. Fabrics enhanced with glitter make the wall hanging sparkly even more. The capitivating shpe of a poinsettia's red leaves inspired an intricate design that is a combination of blocks and pieced sashing. Poinsettias transform into a multifaceted gem of Mother Nature when made in textures of rock, ground, and leaf. Frame one block with sashing and three borders to create a stellar focal point in a wall hanging. Rethink panel prints! 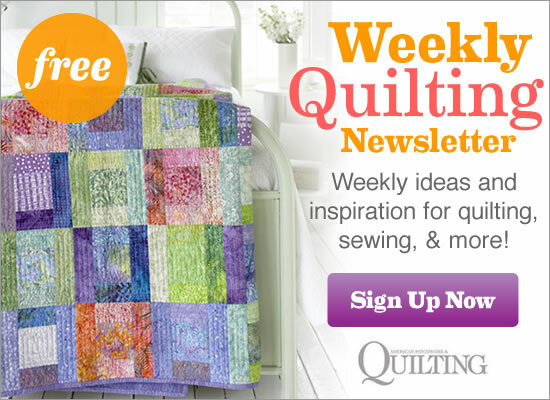 Make the most of a panel's open space to showcase (or practice) machine quilting. Have no fear--we'll show you the stitches step-by-step. Cheddar is even better when paired with rich tomat reds and deep browns. Use the colorway to piece sweet, small baskets embellished with a bit of applique. In this version of Cheddar Baskets, go for dark and dramatic with a fabric collection that pairs florals and a graphic black-and-cream print. Showcase fussy-cut bouquets in the setting triangles and replace the center block with a fussy-cut bouquet.